Nice watch, my husband is very pleased. 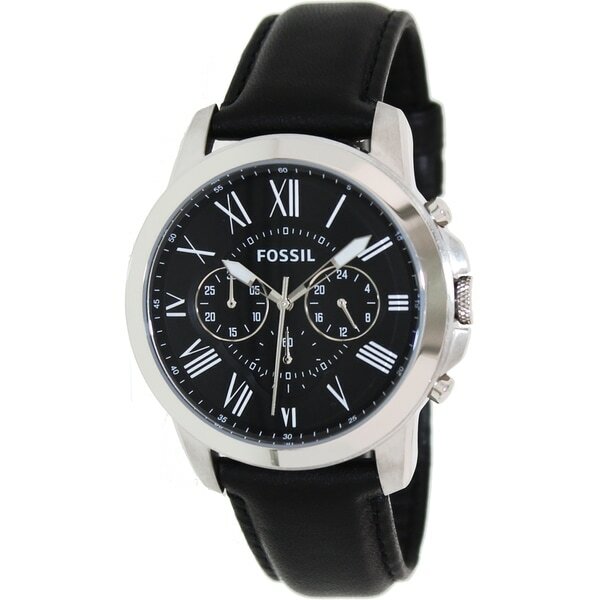 Bring a classic accent to your wardrobe with this Fossil men's Grant watch. This watch features a mature, professional black leather strap that goes perfectly with a business suit, formal wear or business casual. The strap uses a stylish tang buckle clasp closure with ample sizing holes for the perfect fit every time. The wide, stylish casing of this watch is water-resistant up to 330 feet, making it ideal for the active wearer who enjoys swimming in the backyard or snorkeling in exotic places. A screw-down caseback ensures the case stays firmly closed during busy days, and convenient subdials provide extra useful information on the go. The watch is straight class; luminescent roman numerals, genuine sturdy leather and a masculine large case that comes together in a decent fit. Saw this watch in ******* for almost $*** more! Love this watch! My stepson wanted this watch and he loves it. He wears it every single day. I bought this as a gift for someone but when I received it in the mail I was disappointed at the quality. The picture and the price made me think that the quality of the product would be far greater than it was. I promptly returned it because I didn't feel comfortable giving a tacky looking gift. Bought this watch for my boyfriend as a gift and he loves it! Great style! I bought this for my boyfriend and he loved it. The item arrived quick and within a few days. Very satisfied! Great looking watch!!! Love it!! I bought this watch for my husband and he loves it. I wish it were available in different color choices..
Bought as Xmas gift for my husband - he loves it! Could not beat the price! Beautiful watch, got here in time! Xmas gift for my son, he loved it. I bought this for my son and he absolutely loved it It looked nicer than the picture. "Does this watch come in a fossil case?" This will come in a case. "Where is the date display?" Hello Bonal, we apologize for the confusion. The watch does not have a date display. Thank you for shopping with us. I like it for my father. it says grown man!!!!! I liked the price and I;m sorry I missed the sale.